As digital technology erases the boundaries between virtual and brick-and-mortar, traditional banks may be fading into the past. Branchless banking is gaining momentum among millennials which, means customers may no longer need to visit a bank to withdraw money or perform transactions. 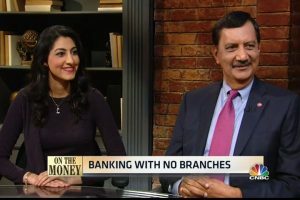 Father and daughter team, BankMobile Chairman & CEO Jay Sidhu and BankMobile Chief Strategy Officer Luvleen Sidhu discuss their big business bet on mobile banking.